Why doesn't xat allow this? Beats me. The current system works with ticket because they think It is more ''secure'' but I don't see any logic in that. Why would you want to wait several weeks to change your own email? xat is the only website that has a system like this. All social media let you change your own email by yourself without the need to create a support ticket. Many of you may ask: What about our account's security? I've seen cases of people getting scammed because some fake xat staff, volunteers, tells them their /account/ and /powers/ have been compromised. How to avoid that? Create a pop out warning people about this. May this scare some users? Yes, but It will remind them NOT to do this. 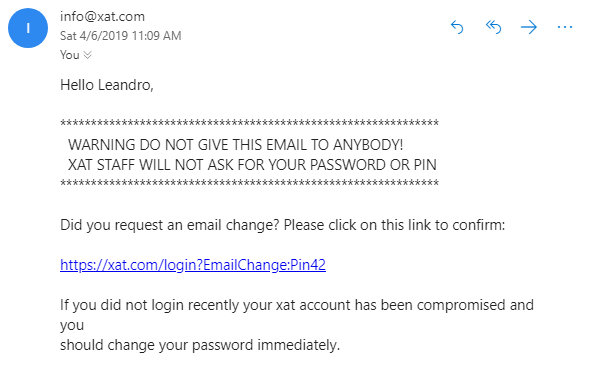 What scammer will have access to our xat accounts AND email provider? None. PLEASE DON'T USE THE SAME PASSWORDS. There is always going to be scammers. Letting people change their own emails or not. How to change your email? Create a new page in which you have the ability to change it to any e-mail you like. First, you will need to login on your account so the ''Change Email'' form should appear. After this, we should get a confirmation email from xat saying that our account's email has been changed. I agree. The process for changing email is not simple by any means. This is a convenient and needed feature for account modification. It's weird how isnt added yet. We cant change our account, or chat email without asking ticket, first part is this. Second part is waiting in xAdmin's department for them simply change your email, well at least groups. Then, 1000 xats for them to transfer the ticket, see where is the logic it didnt get added yet? I agree with @Leandro, but not just on accounts, this should be added to groups too. I know this is just an example but new users shouldn't have too many problems answering the security questions if they've only just done the things volunteers are asking about. But I can appreciate creating a ticket and waiting for replies is a pain. If there is an option to change emails, perhaps only gmail addresses would be allowed and the user would be held for 28 days after doing it (as it is currently). I (and the rest of the community) would be in love with this. Anything not to make a ticket and wait several weeks for it to be done. Also, you would only be able to change your e-mail again after the held runs out. I totally agree with you. Leandro - There must be this. . . . Totally agree. Been hanging on to an old email forever only for xat because I don’t wanna go through the hassle to have it updated for this ID. Why your guys worry a lot of blocking users? Only xat does that and IT IS BORING A LOT, you can change your on... Twitter, Facebook, Rockstar Social Club, PSN, Gmail, Outloook, XBOX, and none of them will block you for changing your email. This is absolutely invalid argument "ohh more security", trust me, we have security enough, users should pay more attention what they do, not all the rest pay for what 1 or 2 users does wrong. Actually there is a lot of security and nothing related to the account, just human issues, "transfer me or you will be block", selling powers and getting blocked, being asked to pay just for changing email. This all is worse than allowing users to simply change THEIR EMAIL from THEIR ACCOUNT. Why your guys worry a lot of blocking users? Only xat does that and IT IS BORING A LOT, you can change your Twitter, Facebook, Rockstar Social Club, PSN, Gmail, Outloook, XBOX, and none of them will block you for changing your email. Im fine with no hold whatsoever. Holds more less piss me off whenever I need to get anything taken care of. Only said about it because the trend seems to be "you can't use your account for anything but chatting if you change anything"
Admins ''care'' a lot about security, but at the moment of allowing users to make quick reports (In chat reports) or making some kind of announcement to all xat users to prevent them from getting scammed, they are nowhere to be seen. Excellent idea, I totally agree. Very cool, Leandro. I wish xat implements this new feature.